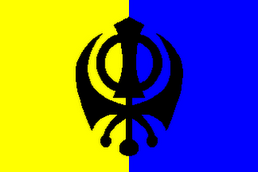 THE ROAD TO KHALISTAN: Regain Our Chardi Kala! We have been remembering our wounds and pain now for a long time. Twenty-five years is a long time in the life of an individual. It is right and proper and necessary that we remember. We will never forget. Those of us who lived through it, whose loved ones were brutally murdered carry a special pain. We will never get over it. We will - we have - however learned to live with it. I remember the song written after the terrorist attacks (?) of September 11,2001, "Where Were You When the World Stopped Turning"? A touching title, but the world didn't stop turning. It goes on and on, around and around. Our search for justice continues. We will continue our demands, loudly and persistently, until those guilty of genocide against us face the rope or until we ourselves are dead. This does not need to be said. We cannot and will not forget. We want Khalistan. We need Khalistan. The way our neighbours, the very people we have been defending and protecting for hundreds of years, turned on us in 1984 underlines this fact. We have the right of every people to self-determination. We are not unreasonable. We demand only that India live up to the promises made to us when we agreed to support them at the time of Independence. Let's move a step further. What is this Khalistan we will build for ourselves? I see a land of rivers and streams, rolling hills of wheat, beautiful prosperous farms, crowned by clean, elegant cities. I see Amritsar a city worthy of our glorious Harimandir Sahib, with pristine blue skies and pure, clean air. I see an end to the ecological disaster that has overtaken and threatens to destroy Punjab. I see ourselves reversing the desertification of the land of our Gurus, of our land. I see our groundwater restored, I see the water of our rivers restored to us. I see a land of joy and happiness. I see a people strong and prosperous and healthy in body, mind and spirit. I see us treating each other with love and respect, all vestiges of castism thrown into oblivion where they belong. I see all of us living as sisters and brothers, both sexes treated - and valued - equally as our Gurus have taught us. I see a land where all people are welcomed in the old Punjabi tradition. I could go on. Am I dreaming? Of course I am! We need our dreams. We need to remember who we are and what we are. We need to remember where we have been - the proud moments and the painful - and we need to move forward. Is this practical? Probably not. But everyone who knows me has heard me say things like "Practicality is overrated." All great dreams are impractical.. Great people move beyond that and accomplish what seems to be impossible. This will not be easy, but worthwhile projects are rarely easy. Can we do this? Of course we can IF we become the people are Gurus taught us to be, if we become real Sikhs, real Khalsa. Think about it. Dream with me and let us move forward to claim what is rightfully ours, spiritually and materially. Before I start sounding less like a Khalsa and more like a motivational speaker, let me leave you with a song that we can sing together as we move forward in chardi kala! It's a dream i could get into! es all we really need to do is live the truth as taught. "Some people look at things as they are and ask Why. I dream of things that never were and ask, Why not?" What were the promises made to Sikhs at the time of partition. Most people do't know of agreements made by INC at that time which resulted in ruin of Punjab. That laid the bases for what happened in 1984. As I write this, a few of those promises are to my immediate right. They will remain there in the sidebar under the heading "Broken Promises." Without those assurances, Congress would not have had the support of the Sikhs and the history of "India" would have been very different. The follow up by Nehru, of course, was along the lines of "The situation has changed. We're in charge now." 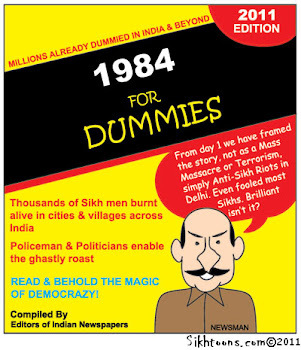 A few days ago, I read something about Khalistan and that brought your blog to mind. I came to check if there was anything new. Haven't you, like me, come to the conclusion that promises made by one nation to another rarely mean anything---unless someone has the power to bring about their fulfillment by sheer force? Does it feel like world organizations like the UNO have the power to do anything, just purely for the sake of justice and humanity in this world? Khalistan, my dear Mai, isn't only your dream. It is the dream of every freedom loving person. It is the voice not only of the Sikhs who suffer in Indian torture cells, but of every Muslim who believes in freedom, just like he believes in free Palestine, free Kashmir, free Iraq and free Afghanistan. Whether a justice loving person knows of the Khalistan issue or not, his love for justice demands the freedom of people with iron wills. Keep it up! I have subscribed to keep myself up to date with your blog. I had been thinking of you and wondering where you had gotten to. I am always happy to hear from you, of course. It brightens my day. I look forward to the day when we can all greet each other and sister and brother and really mean it. It's coming. I don't know when or how - Akal Purakh doesn't usually give me private briefings - and it's coming. The governments of nations break promises like omelet chefs break eggs. If I believed in a devil, I would believe he is in charge of them all. Let it be the way we die."